For the past few weeks i have been thinking of how to format my thoughts on to this screen. I received a message that a Harlequin baby had been born at the Lady Dufferin Hospital, Karachi. I had only read about the condition. I felt this knot in my stomach. This uneasy gripe when I had first started to blog about all kinds of syndromes, diseases etc five years ago. Over the course of time, writing and documenting about all of ’life’s’ normalities has become second nature. I do not gasp. I do not flinch. I help and document. But this was different. After a restless night I arrived at Lady Dufferin. Nervous, sleepless and anxious. I was received by the most amazing Neha Mankani who was the messenger. For those who don’t know Harlequin Ichthyosis in lay terms is a severe genetic disorder that mainly affects the skin. “Infants with this condition are born with very hard, thick skin covering most of their bodies. The skin forms large, diamond-shaped plates that are separated by deep cracks (fissures).”* Limbs and organs can be severely effected and the tightness of the skin can force the eye-lids and lips to turn inside out. After hearing a quick brief, we made our way into the Maternity Ward. The baby was in the NICU under the care of not only a specialised but a very empathetic team. An extremely young girl lay lifeless on the hospital bed. Eyes swollen from a night of non stop crying and spirits broken from not being able to birth a ‘normal’ boy. Almost 36 hours had passed but this girl had not seen her baby. The husband and the elders had strictly told the hospital staff they did not want her to see his sight. By now I had gathered the gist of situations, stories and stigmas. It was a clear case of generations of cousin marriages. When parents share a common ancestor, it is termed a ‘consanguineous’ relationship and there is an increased risk that they will both carry the same faulty gene variation. If both parents have the same gene variation, there is an increased risk of having a child with a genetic condition. The most common form of consanguineous relationship is between first cousins*. After an hour of counselling the mom and revealing to her the true discomfort and pain her baby was struggling with, I saw a spark in her eyes. This session was watched over by both, her mother and her mother-in-law like hawks. Who continued to tell me time and again how it is not possible for them to take “such a baby” home. No where in the discussion did i argue, knowing their financial constraints, their societal ‘embarrassment’ and their mental dilemma. The only persuasive argument I appealed for, was that the mother see her baby from afar at first. A baby who knew nothing better than the warmth of her womb and the soothing muffled tones of his mother’s voice. Right now he was in an incubator with strangers, in a strange surrounding and hearing strange voices. He had zero comfort, love and warmth. I left the mother to ponder a while and made my way with Neha to the NICU. If I could dig up every word associated with ‘impressed’ from a thesaurus, I would use them to describe the NICU staff. No where were cameras in sight, no information being leaked to media/social media. They were working round the clock to meet every need of this little baby. There he was, in that little plastic box. His every breath, movement, feed and urination being monitored. A specialist once told me when Aaliya was going through her surgeries that babies under one can not feel pain. Today I was tearing up on the inside. My heart was aching and my mind could not accept that this child did not know his pain. He did. He yearned for his mother’s comfort. I touched his little hands wrapped up in protective ointment and gauze to keep him moist. This little angel was suffering because of stubborn decisions made by elders. Lack of information for parents sharing the same faulty genes. Lack of awareness to undergo the right testing and treatment during the pregnancy. I made my way back to the ward. Determined to counsel the mother, to make way to her baby. Her baby who desperately needed her love and attention. There in that moment, she picked up her C-sectioned body and walked those slow steps to the NICU. From afar she saw a cloth covered baby, only tubes and monitors visible to her. She then cried and yearned to be united with her little. But this was not possible before the husband granted his permission. He was only safe guarding her mental well-being, the girl told me very convincingly. Many days passed by convincing the parents, the elders and especially the paternal grandfather. Even though Harlequin babies do not survive for too long, it is no one’s right to put a ticker on someone else’s life. Little H.R. was breathing better, feeding better and surviving like a warrior. There was no need of a NICU. There was need for acceptance, love and care. The family did take H.R. home after requesting for a few days extension. It was a kind gesture on the part of the hospital administration and doctors who allowed for this faciliatation to help the little baby. We were scared that he might be abandoned, discarded, or even be dumped in a garbage block. In less than twenty four hours of H.R.’s discharge we heard of his passing away. My heart and mind were already prepared for his lack of survival. It is not my place to condemn the family for faltering, foul play or their negative attitude. I condemn lack of awareness, lack of tolerance, lack of empathy and lack of counselling. Rest in Peace Baby H.R. Thank you NehaMankani for being the power house you are. You are a force to be reckoned with. Thank you NICU Lady Dufferin and keep doing the amazing work you do! Join her group Special Needs Pakistan and contribute to make lives better. Editor’s Note: Harlequin ichthyosis is a severe genetic disorder that mainly affects the skin. Infants with this condition are born with very hard, thick skin covering most of their bodies. The skin forms large, diamond-shaped plates that are separated by deep cracks (fissures). Getting rid of all the weight you have put on during pregnancy is a stressful struggle but to maintain a healthy lifestyle and diet is even a greater struggle. I am in the phase of life where I need all kinds of motivation to keep reminding myself that fit hongi mein. About time for a much needed motivation with Body Makeover Challenge by Tapal and BBRC (Body beat recreational center). If you haven’t heard about it yet, let me tell you about #BMO4. Tapal Green Tea has catechins and much needed antioxidants to aid detoxification and Theanine in it makes you feel relaxed. Much needed boost of refueling after intense workout to keep you healthy and fit. Following the theme, Tapal joins hand with BBRC for a fun fitness challenge called “Body Makeover Challenge” or #BMO4. Tapal Green Tea along with BBRC brought various fitness experts together to compete in toughest challenges while enjoying some Iced Tapal Green Tea and fun giveaways. Hassan Rizvi of BBPR, Nusrat and Sameet from 42 DC, Mustafa from Impulse, Zainab Ansari, cofounder DXD, Hydro, Bilal Munir, and many more were part of body Makeover Challenge & were such a good sport. The Tapal Fitness Challenge included a series of hand claps, pushups, burpees and finally a frog jump all in one rep.
All this effort by top fitness instructors of Pakistan wasn’t just for fun and inspiration. They won some cool stuff too. The Grand Prize included an Apple iWatch, iPod Nano, Yoga Mat, Fitness Gloves, and the entire range of the delicious flavors of Tapal Green Tea. The winner of the Tapal Green Tea Challenge, and the grand prize, was the lucky Mr. Rizwan Noor. Other winners included Mr. Sajid who won the dynamic push up challenge, having preformed a whopping 75 Pushups in less than one minute ( Saw Shahzad Roy doing 72 push-ups in jeeto Pakistan and I was like kiya khata hai yaar). How many push-ups you can do btw? We should take part in such healthy activity and promote fitness lifestyle. Staying healthy should always be a priority. I wish Tapal can bring something really helpful for housewives as part of BMO challenge. Maybe a reality show or something. Aakhir #FitHongiMein bhi is motivation se. Hakim Muhammad Saeed was a significant part of childhood of 80’s & 90’s kids through his urdu publication Naunehal. With his services for educational institutions and language Urdu itself, he use to visit schools and meet students and encourage them to participate in extra curricular activities. If you were a Naunehal reader you might be familiar with those photographs of different school functions and gatherings by Hamdard Pakistan itself. The brand has always been keen to serve people in Pakistan with best health care and educational services. After serving us for more than a century, Hamdard Pakistan decided to change their corporate identity in order to connect with the younger audience more. Their new logo was revealed in an amazingly grand event at Mohatta Palace on Tuesday, 23rd January. Keeping the value of the brand in mind the event was a classy one with legendary guests and very dignified execution. To celebrate the re-branding, Hamdard Pakistan unveiled their new logo followed by first ever Hakim Saeed Awards. The awards were a tribute to Hakim Muhammad Saeed, founder Hamdard Pakistan. Governor Sindh was the chief guest of the event and Hakim Saeed’s Daughter, Saadia Rashid was also there to grace the occasion. Muzna Ibrahim hosted the event beautifully along with Talat Hussain. Hakim Saeed Awards were given to following legendary Pakistanis. Shaheed Aitazaz Hasan’s father received his award with a standing ovation by the audience while late Mr. Masood Ahmed Barkati was awarded a lifetime achievement award. It was an honor to be among the best of the talent from Arts, culture, sports, literature and social change makers of Pakistan. Hamdard Pakistan further went on to win hearts with Ishq Pakistan Qawaali and New TVC celebrating Pakistani heroes with the legacy of Hakim Saeed. Hamdard I’d tye word we can associate with one who is concerned about us, wants us to be well and truly the brand has been one. Wishing all the best to Hamdard Pakistan with hope that they continue inspiring generations. Disclaimer: Weight loss and diets are subject to your health and wellness plus the amount of workout. Don’t opt for any dietary supplement or strict diet plan without consulting a nutritionist. This is a true story of a (famous) guy from Karachi named Abdul Majid. Yes, he’s the famous comics by Majid walay Majid bhai and he’s kind enough to share his journey when I asked in response to his absolutely incredible transformation from 84Kgs to 73kgs in just 60 days. That’s an incredible 11Kgs gone with cabbage soup diet. Majid explains that he was in depression and overeating due to it before Ramazan. Then his friends motivated him to join a boot camp where his trainer encouraged him to go for cabbage soup diet (please consult a dietician before going for such diet). Majid started workout and diet side by side this June. He followed the diet plan mentioned above for 60 days and the results are quite motivating. It is also important to remember that exercise is a must to keep yourself fit alongwith diet. 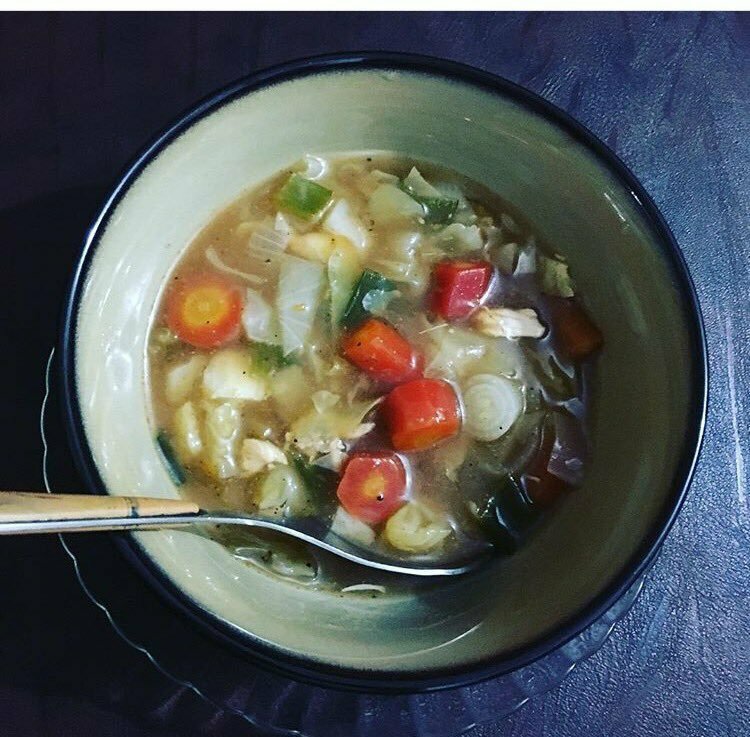 Here’s the recipe of fat burning cabbage soup that he uses to make daily. This soup recipe is believed to melt thighs btw. PS: This is a set recipe for diet purpose. Any modifications might change its nutritional values but Majid didn’t add onion soup packet. You can add an egg instead in the end. Have you been on diet? What’s your secret to a healthy weight loss? Do share. Follow him @comicsbymajid of Twitter to know more.